Once again the current lecture programme is drawing to a close and there are just 2 lectures to look forward to and the AGM. I think it safe to say that it has been another successful year for the Society and our thanks to our programme Secretary for providing such a varied and interesting programme. The final meeting of the session is the ANNUAL GENERAL MEETING which will take place on Thursday June 22nd with the usual wine & cheese and possibly a scientific entertainment. There is a small charge of £3, and any contributions of food will be gratefully accepted, the Society provides the wine. The penultimate lecture in the current session will be on April 20th and is entitled: LOST WORLDS OF THE SOLAR SYSTEM and will be given by Professor Hilary Downes from University College London. The final talk in the current session will be on May 18th when Steven Cutts FRCS from the James Paget University Hospital will discuss the MEDICAL IMPLICATIONS OF SPACE FLIGHT. At the Council meeting on April 6th, Doug Daniels was once more elected as President for the next session. He was pleased to accept once again but he pointed out that at 77, he was beginning to feel his age and that Council should perhaps begin to look for a replacement sooner rather than later. As we are all aging, we never know when we might be suddenly struck down as you will see on the next page. Council invites further nominations for the above posts. Such nominees should be duly proposed and seconded and should have agreed to serve if elected. Such nominees should be duly proposed and seconded by two members of the Society not less than four weeks before the AGM. Nominations should be sent to the Secretary at the address on the programme card or by e-mail : secretary@hampsteadscience.ac.uk by May 25th. Under the revised Constitution, Council will replace one ordinary member, from those who have served longest, each year. At the Council meeting on April 6th Martin Williams was due to retire but Alexander Menegas announced that he would have to retire as he was off to Princeton University in the USA to study physics. We thank Alexander for his work for the Society and we wish him every success with his studies. Shortly before this Newsletter went to the printer, we received the very sad news that Brian Bond had died suddenly after a short illness. At this time our thoughts are with his widow Gina and his family and a fuller obituary will be posted on the website in due course. 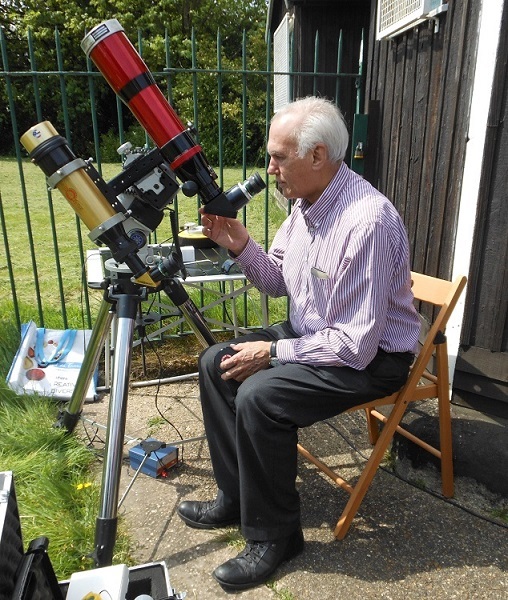 Brian was a dedicated amateur astronomer who joined Terry Pearce’s telescope making class way back in the 1980’s. It was here that he learned about the HSS and the Observatory. He soon joined and became one of our most enthusiastic demonstrators. He acquired a 10-inch Schmidt-Cassegrain telescope and about twice a year he would seek out dark sky observing sites; he was a regular camper at the Kelling Heath Astro camp. Brian embraced the new-fangled digital electronic method of obtaining high resolution images, having acquired a Starlight Express digital camera when they first became available. Brian was interested in all aspects of astronomical observation and it wasn’t long before he obtained a Coronado H-alpha solar telescope to add to his rapidly expanding kit. If it was a sunny Sunday morning, Brian could be found up at the Observatory and he soon became our Solar expert. Disaster struck when his van was broken into and his big telescope and much of the imaging kit was stolen. Fortunately the Coronado was not in the van and the portable mounting was up at the observatory, so Brian was able to continue with his Solar observations. He was also a great help when the Society decided to purchase its own Solar telescope and he put us in touch with the right people to get the best deal. Brian was a most energetic and enthusiastic man with a huge repertoire of interests. Martin Williams knew him from 1973 when Brian taught radio skills at the Grafton Radio Society. He was a keen contester trying to seek out other enthusiasts from around the globe. 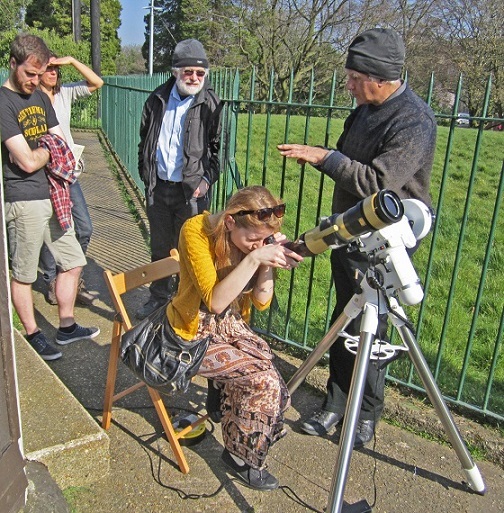 Brian started out observing all aspects of astronomy, but became increasingly interested in Solar activity and ended up doing the bulk of the Sunday duties, often spending many more hours demonstrating the Sun to our visitors than those required, such was his passion for teaching. He was at the observatory for nearly every special event we held, helping to keep the crowds engaged in his noted jovial way. Photograph: Brian Bond standing on right with the Coronado showing visitors the Sun in all its glory. His cheerful passionate presence will be sorely missed by many of us and Sunday mornings will not be the same when we do eventually re-open. I’ll miss his Sunday morning calls, checking up on the weather conditions up here, always a laugh and a real pleasure.